Bitcoin price tumbled below key supports at USD 6,450 and USD 6,400. Ethereum declined below the important USD 200 support. Many altcoins dived more than 10%, including ripple, nano, XLM and bitcoin cash. Bitcoin price failed to stay above the key USD 6,500 pivot level. As a result, BTC/USD started a sharp downward move and tumbled below the USD 6,450 and USD 6,400 support levels. Major altcoins also followed bitcoin and declined sharply between 6%-12%. Ethereum is down more than 10% and is currently (UTC 06:40 AM) struggling to hold the USD 200 support. Ripple and bitcoin cash also fell significantly and moved further into a bearish zone. The market turned red and it seems like there could be more losses in the coming sessions. After a continuous failure to move above the USD 6,700 and USD 6,800 resistances, bitcoin price started a downward move. BTC/USD dropped more than 5% and broke the key USD 6,400 support. The price traded towards the USD 6,250 support, which held losses. Buyers are currently fighting to protect more losses below USD 6,250. However, if sellers remain in action, there is a risk of more losses below the USD 6,250 support. The next major support awaits near the USD 6,100 - USD 6,110 zone. Ethereum price also followed bitcoin and declined heavily after it broke the USD 215 support. ETH/USD is down more than 10% and it recently spiked below the USD 200 support. The price is currently consolidating losses around the USD 200 level. An initial resistance is near USD 205, above which the price may perhaps recover towards the USD 215 resistance (the previous support). Bitcoin cash price dropped significantly after sellers cleared the USD 500 support. BCH/USD is down more than 12% and it remains at a risk of more losses towards the USD 440 and USD 420 levels. On the upside, resistances are visible around the USD 470 and USD 485 levels. Ripple price dropped close to the USD 0.400 support. XRP/USD seems to be under a lot of bearish pressure and if sellers break USD 0.4000, the price could tumble towards the USD 0.350 support. 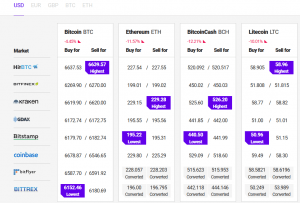 Many altcoins dropped sharply and are down more than 10%, including DCN, THETA, NAS, NANO, CMT, WAN, MIOTA, XLM, XEM, DROP, AION, WTC and PPT. 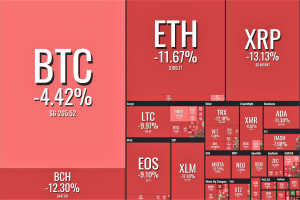 The crypto market clearly moved into the red zone and if bitcoin fails to stay above the important USD 6,250 support, there could be nasty downsides. To recover, BTC/USD needs to move back above the USD 6,400 and USD 6,500 resistance levels. Similarly, a daily close below the USD 200 support may increase selling pressure on ETH/USD in the coming sessions.